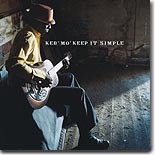 Keb' Mo', one of the more popular crossover blues artists around, comes out with his best CD, Keep It Simple, in a long time, according to one of our reviewers. It's this month's Pick Hit. Now that it's cool to be funky again (as if it's ever gone out of style! ), we again are treated to great music like the retro-sounding Memphis funk soul of The Bo-Keys. This fabulous album, The Royal Sessions, is our Surprise pick for April. We take a look back at a couple of mid-'90s re-issues from a period when the Motown label decided to do the blues in this month's Flashback, including great recordings from Luther Allison, Amos Milburn, Earl King, and others. This month's What's New section features new releases from Kenny Neal & Billy Branch (three different reviews! ), Phoenix singer The Chief, Johnny B. Moore, Jimmy Burns, Eric Clapton, Allman Brothers Band, Ivan Neville, Roy Roberts, British teen soul sensation Joss Stone, Fruteland Jackson, and more.